It’s not too early to make plans to participate in the True Woman ’18: The Truth That Sets Us Free Livestream on September 27–29 . . . at no cost! This 10th anniversary event promises to deliver God’s powerful Truth through challenging teachings, inspiring worship, and engaging dramas. As a leader and influencer, we hope you’ll join us for the Livestream and consider gathering a group to watch so you and your friends can all be changed by the Word. Get all the details and updates at TrueWoman18.com/live. And . . . don’t forget we’re launching our first-ever online study, Abigail: Living with the Difficult People in Your Life on Facebook Live Tuesday, July 31 from 7–7:30 p.m. ET. We hope you’ll join us and request your copy of the six-week Abigail study today! I'm a wife, mother, and member of our church, and I’m involved in women’s ministry. I'm also a woman struggling with chronic pain, which affects all of these roles. At least 100 million Americans have chronic pain. This means that one in three people at your church fights a daily battle with physical issues ranging from mild discomfort to debilitating affliction. Some struggle to exercise and clean their homes; some find it difficult to work jobs; some can’t pick up their children or carry groceries; others are laid up in bed and can hardly function. The reality? Most of the time you won’t know about these pains and their emotional and spiritual implications—many people with chronic issues don’t look sick or weak, and we struggle to ask for help. So what can you do, as a leader, to minister to the hurting women in your congregation? How can you support us, both spiritually and physically? I certainly don't have all the answers, but because I have chronic pain, I’m familiar with what we strugglers often desire and need (even if we won’t admit it). Three helps come to mind. 1. Pray for us . . .
To share. 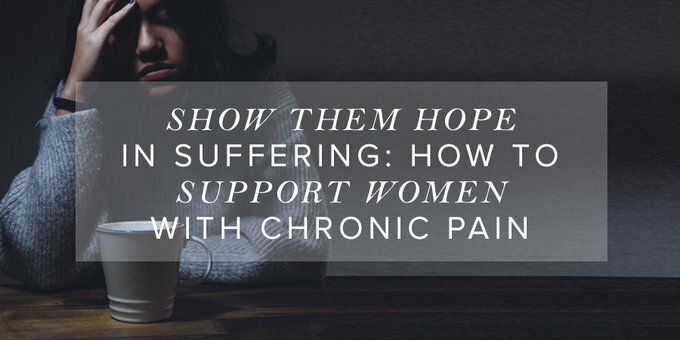 As mentioned, most women won’t talk about their chronic pain, at least not in the sense of seeking support. (Grumbling about it is another thing!) So you can start by praying that we’ll make our struggles and needs known to you and others, with dependence ultimately on Christ. Pray that we’ll humbly seek out church family and leaders for help. To endure. Chronic pain can easily steal our joy and deaden our hope when our eyes aren’t fixed on Jesus. We’re tempted to lose heart. Pray for us, that “though our outer self is wasting away, our inner self [will be] renewed day by day” (2 Cor. 4:16), and that our suffering will produce endurance, character, and hope (Rom. 5:3–4). To heal. While we don’t know God’s will for our pain, we still can ask you to pray for our healing. Because God can do abundantly more than all we ask or think (Eph. 3:20), we trust He can heal us, if He chooses to; He is more than able. God hears your prayers on our behalf in Christ (2 Cor. 1:11), so ask Him boldly to remove our fleshly thorns. Believe me, we’re often making the same request! 2. Meet with us . . .
For encouragement. Like every other woman in your church, we need encouragement from Scripture! Point us to God’s love that will increasingly cast out our fears (1 John 4:18), help us view our chronic pain through the lens of eternity (Col. 3:2), and remind us that we’re able to persevere through Christ’s strength (Phil. 4:13). Share your struggles with us as well and what God is teaching you. Your faith will bolster ours, and your hardships will give us a chance to encourage you in return. For understanding. We hope that our times of meeting together might be useful and encouraging to you as you see our faith being exercised in suffering (Rom. 1:12). Since chronic pain affects so many people, we’d love to help you better grasp this ongoing battle we’re fighting so your ministry to women within the church might be strengthened and bear much fruit. 3. Support us . . .
With practical help. Asking for help can be hard for chronic sufferers because we’re often too tired to think through our needs, and even when we do, it can feel like too much effort to seek people out. So we’d appreciate your proactive care to leverage the Body of Christ for practical help (Acts 4:32) like cleaning our homes, delivering groceries, childcare, errand running, and rides to doctor’s appointments. These acts of service greatly bless us! With pastoral care. As you seek to know us and show us the love of Christ, would you inform our pastoral leadership about this chronic battle we fight? We glean God’s Truth from their preaching and would love to be kept in mind as they create sermon application points, especially on the topic of suffering. For those who are laid up in bed because of pain, pastoral visits and corporate prayer mean the world. Ultimately, remember, sister, that the weight of our struggles does not fall entirely upon you. The Lord might be pleased to use you as you pray and leverage His Church, but this task is not solely yours. This is why God gives us the beautiful, diverse Body of Christ. Yet there’s one help you can always employ: By far, the most important work of your ministry is to continually point us to Christ, our suffering Savior, who went through the greatest pain and darkest battle so ours would eventually end (Isa. 53:4–10). Show us the beauty of Jesus, who rose from the grave and sits at the Father’s right hand in heaven, who strengthens us by His Spirit and reminds us that we are indeed God’s children (Rom. 8:16–17). Show us how near He is to the brokenhearted, how He saves the crushed in spirit (Ps. 34:18). He is our hope, both for persevering through today’s pains and for entering eternal glory, when we’ll be restored forever, body and soul (Rev. 21)—and we praise Him for using you as His instrument to minister these very great and precious truths to us. Our team loves sharing quality posts to help you serve Christ to the fullest in your calling. If you have been helped or encouraged by this writer today, would you consider giving a few dollars to support the Leader Connection blog? Kristen Wetherell is a writer, Bible teacher, and the content manager at Unlocking the Bible. She is co-author of Hope When It Hurts: Biblical Reflections to Help You Grasp God’s Purpose in Your Suffering. She and her husband are members of The Orchard in Arlington Heights, Illinois. They have one sweet daughter, Joanna. The Leader Connection blog is written for leaders by leaders to inspire you to ministry excellence.